Are you going on a holiday with your rental car and probably worried if all of your luggage will fit in boot? If so, you may be hysterically looking for ways to check if everything fits – particularly if you have already did your best to make it all work. 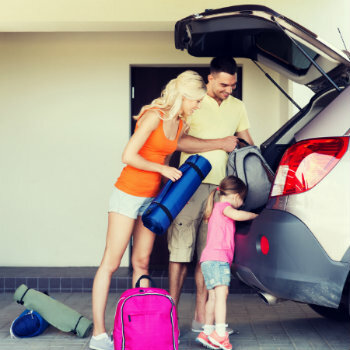 Here at VroomVroomVroom, we are used to providing the easiest and quickest way to book a car hire, and we know that each vehicle's boot capacity is different. So whether you are dreaming about hitting the road and doing a big lap of Australia, or swimming at Bondi Beach in Sydney or St. Kilda Beach in Melbourne, the following tips and strategies will help make your holiday packing easier and more fun. Empty and clean your vehicle. Packing begins before you open the trunk of your car, hence it's important that you already know what to pack in your vehicle. Pack things and organise all the items you will need on your trip in advance. Now time to grab all your luggage (we recommend you use duffle bags for each group of items). Pack systematically. Line up and place your bags carefully at the back of the car. Don't just toss whichever item that's nearest at hand. Instead group your luggage methodically, starting with bigger items followed by the medium sized and smaller packages (or base them on weight, fragility and shape). Learn how to determine items according to their necessity and how much space they will occupy. Take note that fragile items should be wrapped in clothes, towels, or bed sheets for cushioning. Pack the essentials. Remember that important items, such as road-side emergency kit, first aid and emergency kit, flashlight, and blanket, must be accessible at all times. Now if you've packed the car as orderly as possible and still have (essential) items left, this is where you'll probably have to make an important decision, like asking yourself: "Do I really need all this stuff?" It's time to reevaluate your list. Some disposable items like food and drinks can be purchased, so at least limit packing these kinds of items. This works also for the bigger items that you want to bring but actually don't need so you can save up some space. Keep your car balanced. All these handy information, like sorting out heavy items throughout your car will help your vehicle to operate smoothly and save less fuel, particularly if you're going long distance. Have an adequate room for passengers. C'mon, it's a no-brainer! Don't place your luggage in and around the passenger rear seat, not only is it very discomforting, it is also risky in the event of an accident. Add to that, nobody likes to spend 6-12 hours in the back of a car crammed in like sardines.